Last year, I was given the privilege in reading an advanced copy of the brilliant Ragdoll. This book was the book that ignited my interest in Crime, Mystery and Thriller books. So, when I was given the chance at reading Hangman, there was no hesitation. I was desperate to find out what Daniel Cole had in store for his characters. I read very little about the book and went into it cold, confident that this would be as every bit as good as Ragdoll was. Needless to say, it didn’t disappoint. The only assumption I did have was that this would continue with Detective William “Wolf” Fawkes”. It was quickly made clear that Fawkes was still missing after the events that concluded Ragdoll and that the book would centre around newly promoted Chief Inspector Emily Baxter. 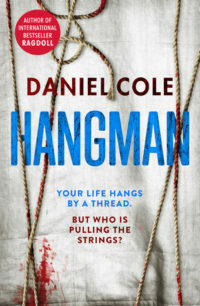 Just like the first book, Hangman is centred around a number of horrific crimes that have little or no relation to each other. The first one seemed to indicate that these crimes were somehow related to the Ragdoll killings in the first book, due to fact that the first victim shared their name with William Fawkes. However, rather than the crimes being concentrated in the UK, this book has a slightly international affair with crimes also being committed in New York City. Since these crimes are also being conducted on foreign soil too, Baxter is forced to work with both the CIA and FBI. The events or Ragdoll have left Baxter finding it difficult to trust anyone, so forcing her to work with Rouche from the CIA and Cruise from the FBI added another complication to solving the case. As we have come to expect, the FBI and CIA have their own agenda and though there is a pretence that they are working towards the common goal, you know that each department wants to claim the glory of catching the perpetrator. As with Ragdoll, Hangman constantly keeps you on your toes as a reader and it is a testament to the author that you feel as if you are actually with Baxter on this roller coaster rider. There is no hints or insights that you as the reader are privy to, while the lead is still trying to figure out what is going on. This adds to the tension and with each crime, the tension builds and they keep building in both the severity and the impact. Cole doesn’t pull any punches, but he manages to balance some of the most horrific and shocking incidents, there are moments of humour that grounds the book brilliantly. As the book hurtles towards its conclusion, there was still no clear indication on what relates these crimes and who is the mastermind behind them. Time ticks down and even when the final act plays out and the truth is finally laid bare, Cole still manages to leave one final jaw dropping revelation. As I said, this book centres around Baxter and it was intriguing to see how she manages to pick up the pieces from the end of Ragdoll. You can see that she is still very fragile and that the only people she trusts is Edmunds, who has returned to Fraud after his stint in Homicide and Finlay, a recently retired colleague. After finishing the book, I couldn’t help wondering if Baxters inability to trust, especially Rouche, ended up hindering her investigation. It was interesting to read the aftermath of all this and even by the end of the book, I still think that there is a long way for Baxter to go. On the subject of Rouche, it was always difficult to find a character to fill Fawkes rather large shoes. Rather than have a Fawkes: Version 2, Rouche is his own character with his own demons. Deep down, I knew that Cole would not go over old ground, but I couldn’t help but feel that there was some chance that it may be the same. The other character that really hit a chord with me was Edmunds from the first book. I felt his frustration at having being so central to the conclusion of the Ragdoll case and to be thrust back into Fraud. It was clear that this step back could not last and when Baxter pulls him in, it was a joy to see him come to life again. That is not to say that there is no fallout for Edmunds, but I wait to see what life, or more accurately Cole, will throw at him in the next book. Hangman is that rare book that does not suffer from second book syndrome. It is accessible enough for those who did not read but has enough little titbits relating to the first for those of us who did.